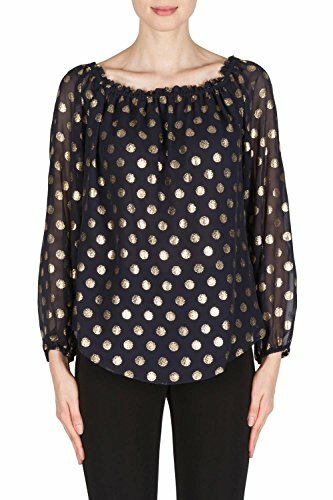 Joseph Ribkoff Midnight Blue/Gold Top With Polka Dot Details Style 181608 by Joseph Ribkoff at Femi Store. Hurry! Limited time offer. Offer valid only while supplies last. View More In Knits & Tees. Authentic Joseph Ribkoff, Official Designer of Miss America, Made in Canada. Spring/Summer 2018 Collection, Style: 181608, Color: Midnight Blue/Gold, Approximate length (size 12) : 27"
Cold water hand wash or hand wash cycle. Do not bleach. Hang to dry. Do not tumble dry. Do not iron. Do not dry clean. Remove excess water promptly.